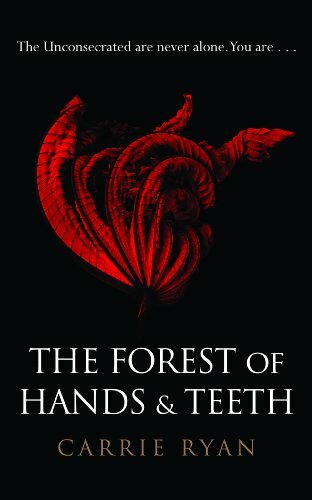 Midnyte Reader: The Forest of Hands and Teeth. 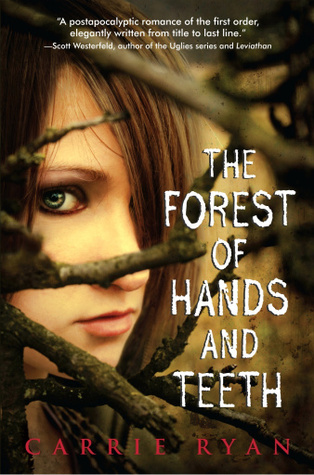 Title/Author: The Forest of Hands and Teeth by Carrie Ryan. Favorite quote: “Nothing in this world is dependent enough to withstand the Unconsecrated. Not even us.” ~Travis. All in all: LOVED IT! My Thoughts: This reminded me of the movie The Village, except with zombies. However, it isn’t a zombie novel. It’s a novel about hopes, dreams and faith. The writing is lovely and strong and this reflects in the main character, Mary’s voice. I am not sure what makes this a YA book, except the character is probably a teen, although the book doesn't even specify that except to say she is of marrying age. I feel that this is a great story for all ages with valuable issues and character behavior worthy of study. In my opinion, everything in the plot comes at precisely the right time. Nothing is revealed too quickly or slowly. A lot of the story takes place in Mary’s head, which I loved. Sometimes it was hard for me to visualize the surroundings and settings in great detail, yet I still knew what was happening and the urgency of the events. Mary is an amazing character. She is not perfect. She covets. She is restless. She is not a “Mary Sue,” but defiant in her own quiet way and selfish in her own way. She makes choices that she understands may have consequences and her longings almost overwhelm and endanger her, but her own desires of finding the truth and satisfying her own needs and feelings overrule everything else. She can’t understand why no one else in her small circle has the same feelings. I think that she feels that if she finds what she has been dreaming about, then her mother’s stories held truth and the faith she kept all her life is not in vain. I think her one huge fear is to lose hope. The relationships in the book were amazing. There is a love quadrangle, between Mary, her best friend Cass and Harry and Travis who are brothers. The complicated thread between them all is astonishing and insightful and it is eye opening when feelings and motives are revealed. As Mary and her group struggle on and try to survive they each realize what is most important to them. The story is deep and intricate, but not hard to follow. I don't feel like I've gotten too deep in discussing this book and part of the reason is I don't want to give away too much. However, I will say that this is one of the best novels I've read in a long time and I would be up for discussing it anytime. Oh YAY! I just bought this book this weekend and I'm so glad you posted this review! I have high hopes for it, and judging by your thoughts, it's going to live up to them. I'm very intrigued by the love quadrangle:) Can't wait! This was my fave book of last year...well top first the other one was Shiver by maggie stiefvater. I loved it and I thought of The Village as well. Awesome. I've been considering this one. I will definitely read it now! I did find this story was too slow. Mary frustrated me like no other character ever has. OMG I wanted to throttle her so many times. Yes, I'd never felt such an intimate connect to a character but her obsession with the ocean became sickening to me. I was tried of Mary even mentioning it by the middle of the book! I would even dare to say that there was no love quadrangle, only Mary and her selfish love for the ocean. Sorry, Pam. Obviously I loved the writing or I wouldn't feel so much disgust for Mary. This was one of my absolute favorite books from 2009. Stellar debut novel, and I thought The Dead-Tossed Waves held up well as a sequel. Must get around to reading the third book some time this year. @Jenny-I'm looking forward to your review. @Nat-I still have to read Shiver! @Smash-I haven't heard great things about the follow ups. I'm not sure if I'll get to them. @Delphyne-I look forward to your thoughts on it. @Missie-Wow! This is why I love the blogging community. I love hearing other thoughts and povs. Although it wasn't the same for me, I can totally understand your frustration, although I didn't experience it while reading this book. I thought your comment @no love triangle, only Mary & her selfish love for the ocean was hysterical. And please don't EVER stop ranting. Another person considering this book, may feel just the way you would! @Rabid Fox:This is one of my favs too. I'll check out DTW.